The first part of the contest will run from Monday April 20th to and including the last game before the All-Star Game July 14, 2015 . The 2nd part of the contest will run from Monday July 20th to and including the last game of the season. The entry fee will be a $300.00 deposit into your 1Vice account and is yours to play with as you normally would with any deposit. The entry fee also includes the normal 150% bonus from 1Vice and the usual bonus restrictions will apply. There is a $300 entry for each part of the contest. You are not required to play both. for confirmation and other information. 4th: $500 free play account. NOTE: If we get 40 people or more entered for each of the two parts the above prize amounts will double! A player is forbid from picking opposite sides of the same game. is there a minimum number of plays for each segment and also a maxinum number of play and when is the last date to get in each contest. Going to give 1vice a try. And also play in this contest for the first time. the 2nd half for the increase in prizes? I believe we had 32 players. for more details on the contest. ANY QUESTIONS PLEASE EMAIL ME, THANKS. Due to some technical problems, the start date for the contest will be Monday April 27th. Deposits can still be made until next weekend. The authentication code to join the contest after signing-up has been sent. 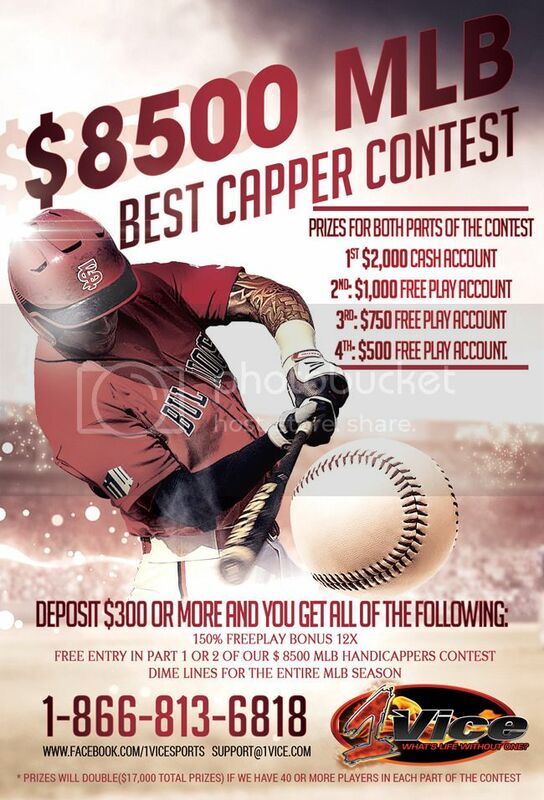 The contest will be 125 plays exactly (no more or no less) from the daily provided games sides or totals. NO runlines. The contest will start Monday April 27th and run to the last game before the All-Star break. On the final week of the contest ONE play must be played to be eligible. All games are Action not listed pitchers. Plays are hidden from others until they start. Rain shortened games will count for sides as a win or loss and the total will be void. The winner will be the player with most +net units at the end of the contest. you click "join a contest"
enter the authentication code i have emailed you.